Genomics refers to the study of the genome in contrast to genetics which refers to the study of genes and their roles in inheritance. Genomics can be considered a discipline in genetics. It applies recombinant DNA, DNA sequencing methods, and bioinformatics to sequence, assemble, and analyze the function and structure of genomes (the complete set of DNA within a single cell of an organism). Advances in genomics have triggered a revolution in discovery-based research to understand even the most complex biological systems such as the brain. The field includes efforts to determine the entire DNA sequence of organisms and fine-scale genetic mapping. The field also includes studies of intragenomic phenomena such as heterosis, epistasis, pleiotropy and other interactions between loci and alleles within the genome. In contrast, the investigation of the roles and functions of single genes is a primary focus of molecular biology or genetics and is a common topic of modern medical and biological research. Research carried out into single genes does not generally fall into the definition of genomics unless the aim of this genetic, pathway, and functional information analysis is to elucidate its effect on, place in, and response to the entire genomes networks. 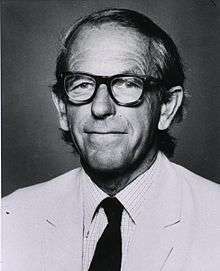 In addition to his seminal work on the amino acid sequence of insulin, Frederick Sanger and his colleagues played a key role in the development of DNA sequencing techniques that enabled the establishment of comprehensive genome sequencing projects. 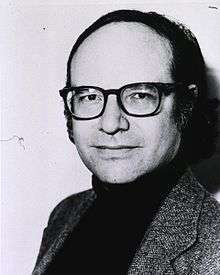 In 1975, he and Alan Coulson published a sequencing procedure using DNA polymerase with radiolabelled nucleotides that he called the Plus and Minus technique. This involved two closely related methods that generated short oligonucleotides with defined 3' termini. These could be fractionated by electrophoresis on a polyacrylamide gel and visualised using autoradiography. The procedure could sequence up to 80 nucleotides in one go and was a big improvement, but was still very laborious. Nevertheless, in 1977 his group was able to sequence most of the 5,386 nucleotides of the single-stranded bacteriophage φX174, completing the first fully sequenced DNA-based genome. The refinement of the Plus and Minus method resulted in the chain-termination, or Sanger method (see below), which formed the basis of the techniques of DNA sequencing, genome mapping, data storage, and bioinformatic analysis most widely used in the following quarter-century of research. In the same year Walter Gilbert and Allan Maxam of Harvard University independently developed the Maxam-Gilbert method (also known as the chemical method) of DNA sequencing, involving the preferential cleavage of DNA at known bases, a less efficient method. For their groundbreaking work in the sequencing of nucleic acids, Gilbert and Sanger shared half the 1980 Nobel Prize in chemistry with Paul Berg (recombinant DNA). Most of the microorganisms whose genomes have been completely sequenced are problematic pathogens, such as Haemophilus influenzae, which has resulted in a pronounced bias in their phylogenetic distribution compared to the breadth of microbial diversity. Of the other sequenced species, most were chosen because they were well-studied model organisms or promised to become good models. Yeast (Saccharomyces cerevisiae) has long been an important model organism for the eukaryotic cell, while the fruit fly Drosophila melanogaster has been a very important tool (notably in early pre-molecular genetics). The worm Caenorhabditis elegans is an often used simple model for multicellular organisms. The zebrafish Brachydanio rerio is used for many developmental studies on the molecular level, and the flower Arabidopsis thaliana is a model organism for flowering plants. The Japanese pufferfish (Takifugu rubripes) and the spotted green pufferfish (Tetraodon nigroviridis) are interesting because of their small and compact genomes, which contain very little noncoding DNA compared to most species. The mammals dog (Canis familiaris), brown rat (Rattus norvegicus), mouse (Mus musculus), and chimpanzee (Pan troglodytes) are all important model animals in medical research. Historically, sequencing was done in sequencing centers, centralized facilities (ranging from large independent institutions such as Joint Genome Institute which sequence dozens of terabases a year, to local molecular biology core facilities) which contain research laboratories with the costly instrumentation and technical support necessary. As sequencing technology continues to improve, however, a new generation of effective fast turnaround benchtop sequencers has come within reach of the average academic laboratory. On the whole, genome sequencing approaches fall into two broad categories, shotgun and high-throughput (aka next-generation) sequencing. Shotgun sequencing (Sanger sequencing is used interchangeably) is a sequencing method designed for analysis of DNA sequences longer than 1000 base pairs, up to and including entire chromosomes. It is named by analogy with the rapidly expanding, quasi-random firing pattern of a shotgun. 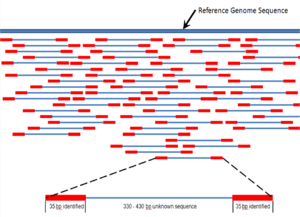 Since the chain termination method of DNA sequencing can only be used for fairly short strands (100 to 1000 base pairs), longer DNA sequences must be broken into random small segments which are then sequenced to obtain reads. 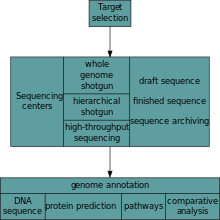 Multiple overlapping reads for the target DNA are obtained by performing several rounds of this fragmentation and sequencing. Computer programs then use the overlapping ends of different reads to assemble them into a continuous sequence. 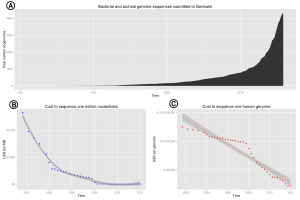 Shotgun sequencing is a random sampling process, requiring over-sampling to ensure a given nucleotide is represented in the reconstructed sequence; the average number of reads by which a genome is over-sampled is referred to as coverage. For much of its history, the technology underlying shotgun sequencing was the classical chain-termination method, which is based on the selective incorporation of chain-terminating dideoxynucleotides by DNA polymerase during in vitro DNA replication. Developed by Frederick Sanger and colleagues in 1977, it was the most widely used sequencing method for approximately 25 years. More recently, Sanger sequencing has been supplanted by "Next-Gen" sequencing methods, especially for large-scale, automated genome analyses. However, the Sanger method remains in wide use in 2013, primarily for smaller-scale projects and for obtaining especially long contiguous DNA sequence reads (>500 nucleotides). Chain-termination methods require a single-stranded DNA template, a DNA primer, a DNA polymerase, normal deoxynucleosidetriphosphates (dNTPs), and modified nucleotides (dideoxyNTPs) that terminate DNA strand elongation. These chain-terminating nucleotides lack a 3'-OH group required for the formation of a phosphodiester bond between two nucleotides, causing DNA polymerase to cease extension of DNA when a ddNTP is incorporated. The ddNTPs may be radioactively or fluorescently labelled for detection in automated sequencing machines. 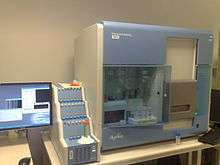 Typically, these automated DNA-sequencing instruments (DNA sequencers) can sequence up to 96 DNA samples in a single batch (run) in up to 48 runs a day. The high demand for low-cost sequencing has driven the development of high-throughput sequencing (or next-generation sequencing [NGS]) technologies that parallelize the sequencing process, producing thousands or millions of sequences at once. High-throughput sequencing technologies are intended to lower the cost of DNA sequencing beyond what is possible with standard dye-terminator methods. In ultra-high-throughput sequencing as many as 500,000 sequencing-by-synthesis operations may be run in parallel. 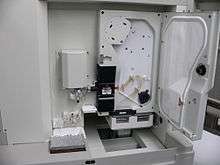 Illumina Genome Analyzer II System. Illumina technologies have set the standard for high throughput massively parallel sequencing. Solexa, now part of Illumina, developed a sequencing method based on reversible dye-terminators technology acquired from Manteia Predictive Medicine in 2004. This technology had been invented and developed in late 1996 at Glaxo-Welcome's Geneva Biomedical Research Institute (GBRI), by Dr. Pascal Mayer and Dr Laurent Farinelli. In this method, DNA molecules and primers are first attached on a slide and amplified with polymerase so that local clonal colonies, initially coined "DNA colonies", are formed. To determine the sequence, four types of reversible terminator bases (RT-bases) are added and non-incorporated nucleotides are washed away. Unlike pyrosequencing, the DNA chains are extended one nucleotide at a time and image acquisition can be performed at a delayed moment, allowing for very large arrays of DNA colonies to be captured by sequential images taken from a single camera. Decoupling the enzymatic reaction and the image capture allows for optimal throughput and theoretically unlimited sequencing capacity. With an optimal configuration, the ultimately reachable instrument throughput is thus dictated solely by the analogic-to-digital conversion rate of the camera, multiplied by the number of cameras and divided by the number of pixels per DNA colony required for visualizing them optimally (approximately 10 pixels/colony). In 2012, with cameras operating at more than 10 MHz A/D conversion rates and available optics, fluidics and enzymatics, throughput can be multiples of 1 million nucleotides/second, corresponding roughly to 1 human genome equivalent at 1x coverage per hour per instrument, and 1 human genome re-sequenced (at approx. 30x) per day per instrument (equipped with a single camera). The camera takes images of the fluorescently labeled nucleotides, then the dye along with the terminal 3' blocker is chemically removed from the DNA, allowing the next cycle. Ion Torrent Systems Inc. developed a sequencing approach based on standard DNA replication chemistry. This technology measures the release of a hydrogen ion each time a base is incorporated. A microwell containing template DNA is flooded with a single nucleotide, if the nucleotide is complementary to the template strand it will be incorporated and a hydrogen ion will be released. This release triggers an ISFET ion sensor. If a homopolymer is present in the template sequence multiple nucleotides will be incorporated in a single flood cycle, and the detected electrical signal will be proportionally higher. Sequence assembly refers to aligning and merging fragments of a much longer DNA sequence in order to reconstruct the original sequence. This is needed as current DNA sequencing technology cannot read whole genomes as a continuous sequence, but rather reads small pieces of between 20 and 1000 bases, depending on the technology used. 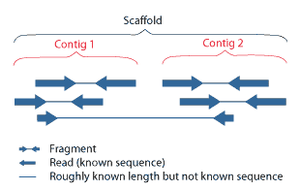 Typically the short fragments, called reads, result from shotgun sequencing genomic DNA, or gene transcripts (ESTs). Assembly can be broadly categorized into two approaches: de novo assembly, for genomes which are not similar to any sequenced in the past, and comparative assembly, which uses the existing sequence of a closely related organism as a reference during assembly. Relative to comparative assembly, de novo assembly is computationally difficult (NP-hard), making it less favorable for short-read NGS technologies. 1 2 National Human Genome Research Institute (2010-11-08). 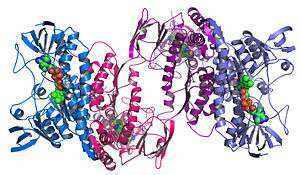 "FAQ About Genetic and Genomic Science". Genome.gov. Retrieved 2011-12-03. ↑ Concepts of genetics (10th ed.). San Francisco: Pearson Education. 2012. ISBN 9780321724120. ↑ Kadakkuzha BM, Puthanveettil SV (Jul 2013). "Genomics and proteomics in solving brain complexity". Molecular bioSystems. 9 (7): 1807–21. doi:10.1039/C3MB25391K. PMID 23615871. 1 2 3 4 5 6 7 8 9 Pevsner J (2009). Bioinformatics and functional genomics (2nd ed.). Hoboken, N.J: Wiley-Blackwell. ISBN 9780470085851. ↑ Culver KW, Labow MA (2002-11-08). "Genomics". In Robinson R. Genetics. Macmillan Science Library. Macmillan Reference USA. ISBN 0028656067. ↑ "Henry George Liddell, Robert Scott, An Intermediate Greek-English Lexicon, γίγνομαι". Retrieved 2015-05-13. ↑ Yadav SP (Dec 2007). "The wholeness in suffix -omics, -omes, and the word om". Journal of Biomolecular Techniques. 18 (5): 277. PMC 2392988 . PMID 18166670. ↑ Ankeny RA (Jun 2003). "Sequencing the genome from nematode to human: changing methods, changing science". Endeavour. 27 (2): 87–92. doi:10.1016/S0160-9327(03)00061-9. PMID 12798815. ↑ Holley RW, Apgar J, Everett GA, Madison JT, Marquisee M, Merrill SH, Penswick JR, Zamir A (Mar 1965). "Structure of a ribonucleic acid". Science. 147 (3664): 1462–5. Bibcode:1965Sci...147.1462H. doi:10.1126/science.147.3664.1462. PMID 14263761. ↑ Fiers W, Contreras R, Duerinck F, Haegeman G, Iserentant D, Merregaert J, et al. (Apr 1976). "Complete nucleotide sequence of bacteriophage MS2 RNA: primary and secondary structure of the replicase gene". Nature. 260 (5551): 500–7. Bibcode:1976Natur.260..500F. doi:10.1038/260500a0. PMID 1264203. ↑ Tamarin RH (2004). Principles of genetics (7 ed.). London: McGraw Hill. ISBN 9780071243209. 1 2 Sanger F, Air GM, Barrell BG, Brown NL, Coulson AR, Fiddes CA, Hutchison CA, Slocombe PM, Smith M (Feb 1977). "Nucleotide sequence of bacteriophage phi X174 DNA". Nature. 265 (5596): 687–95. Bibcode:1977Natur.265..687S. doi:10.1038/265687a0. PMID 870828. ↑ Kaiser O, Bartels D, Bekel T, Goesmann A, Kespohl S, Pühler A, Meyer F (Dec 2003). "Whole genome shotgun sequencing guided by bioinformatics pipelines--an optimized approach for an established technique" (PDF). Journal of Biotechnology. 106 (2–3): 121–33. doi:10.1016/j.jbiotec.2003.08.008. PMID 14651855. ↑ Sanger F, Nicklen S, Coulson AR (Dec 1977). "DNA sequencing with chain-terminating inhibitors". Proceedings of the National Academy of Sciences of the United States of America. 74 (12): 5463–7. Bibcode:1977PNAS...74.5463S. doi:10.1073/pnas.74.12.5463. PMC 431765 . PMID 271968. ↑ Maxam AM, Gilbert W (Feb 1977). "A new method for sequencing DNA". Proceedings of the National Academy of Sciences of the United States of America. 74 (2): 560–4. Bibcode:1977PNAS...74..560M. doi:10.1073/pnas.74.2.560. PMC 392330 . PMID 265521. ↑ Shinozaki K, Ohme M, Tanaka M, Wakasugi T, Hayashida N, Matsubayashi T, et al. (Sep 1986). "The complete nucleotide sequence of the tobacco chloroplast genome: its gene organization and expression". The EMBO Journal. 5 (9): 2043–2049. PMC 1167080 . PMID 16453699. ↑ Fleischmann RD, Adams MD, White O, Clayton RA, Kirkness EF, Kerlavage AR, et al. (Jul 1995). "Whole-genome random sequencing and assembly of Haemophilus influenzae Rd". Science. 269 (5223): 496–512. Bibcode:1995Sci...269..496F. doi:10.1126/science.7542800. PMID 7542800. ↑ "Complete genomes: Viruses". NCBI. 2011-11-17. Retrieved 2011-11-18. ↑ "Genome Project Statistics". Entrez Genome Project. 2011-10-07. Retrieved 2011-11-18. ↑ Zimmer C (2009-12-29). "Scientists Start a Genomic Catalog of Earth's Abundant Microbes". The New York Times. ISSN 0362-4331. Retrieved 2012-12-21. ↑ Wu D, Hugenholtz P, Mavromatis K, Pukall R, Dalin E, Ivanova NN, Kunin V, Goodwin L, Wu M, Tindall BJ, Hooper SD, Pati A, Lykidis A, Spring S, Anderson IJ, D'haeseleer P, Zemla A, Singer M, Lapidus A, Nolan M, Copeland A, Han C, Chen F, Cheng JF, Lucas S, Kerfeld C, Lang E, Gronow S, Chain P, Bruce D, Rubin EM, Kyrpides NC, Klenk HP, Eisen JA (Dec 2009). "A phylogeny-driven genomic encyclopaedia of Bacteria and Archaea". Nature. 462 (7276): 1056–60. Bibcode:2009Natur.462.1056W. doi:10.1038/nature08656. PMC 3073058 . PMID 20033048. ↑ "Human gene number slashed". BBC. 2004-10-20. Retrieved 2012-12-21. ↑ Yue GH, Lo LC, Zhu ZY, Lin G, Feng F (Apr 2006). "The complete nucleotide sequence of the mitochondrial genome of Tetraodon nigroviridis". DNA Sequence. 17 (2): 115–21. doi:10.1080/10425170600700378. PMID 17076253. ↑ National Human Genome Research Institute (2004-07-14). "Dog Genome Assembled: Canine Genome Now Available to Research Community Worldwide". Genome.gov. Retrieved 2012-01-20. 1 2 McElheny V (2010). Drawing the map of life : inside the Human Genome Project. New York NY: Basic Books. ISBN 9780465043330. ↑ Abecasis GR, Auton A, Brooks LD, DePristo MA, Durbin RM, Handsaker RE, Kang HM, Marth GT, McVean GA (Nov 2012). "An integrated map of genetic variation from 1,092 human genomes". Nature. 491 (7422): 56–65. Bibcode:2012Natur.491...56T. doi:10.1038/nature11632. PMC 3498066 . PMID 23128226. ↑ Nielsen R (Oct 2010). "Genomics: In search of rare human variants". Nature. 467 (7319): 1050–1. Bibcode:2010Natur.467.1050N. doi:10.1038/4671050a. PMID 20981085. ↑ Eisen JA (2012). "Badomics words and the power and peril of the ome-meme". GigaScience. 1 (1): 6. doi:10.1186/2047-217X-1-6. PMC 3617454 . PMID 23587201. ↑ Hotz RL (2012-08-13). "Here"s an Omical Tale: Scientists Discover Spreading Suffix". Wall Street Journal. ISSN 0099-9660. Retrieved 2013-01-04. ↑ Scudellari, Megan (2011-10-01). "Data Deluge". The Scientist. Retrieved 2013-01-04. ↑ Chaston J, Douglas AE (Aug 2012). "Making the most of "omics" for symbiosis research". The Biological Bulletin. 223 (1): 21–9. PMC 3491573 . PMID 22983030. ↑ McCutcheon JP, von Dohlen CD (Aug 2011). "An interdependent metabolic patchwork in the nested symbiosis of mealybugs". Current Biology. 21 (16): 1366–72. doi:10.1016/j.cub.2011.06.051. PMC 3169327 . PMID 21835622. 1 2 Monya Baker (2012-09-14). "Benchtop sequencers ship off" (Blog). Nature News Blog. Retrieved 2012-12-22. ↑ Quail MA, Smith M, Coupland P, Otto TD, Harris SR, Connor TR, Bertoni A, Swerdlow HP, Gu Y (2012). "A tale of three next generation sequencing platforms: comparison of Ion Torrent, Pacific Biosciences and Illumina MiSeq sequencers". BMC Genomics. 13: 341. doi:10.1186/1471-2164-13-341. PMC 3431227 . PMID 22827831. 1 2 Staden R (Jun 1979). "A strategy of DNA sequencing employing computer programs". Nucleic Acids Research. 6 (7): 2601–10. doi:10.1093/nar/6.7.2601. PMC 327874 . PMID 461197. ↑ Anderson S (Jul 1981). 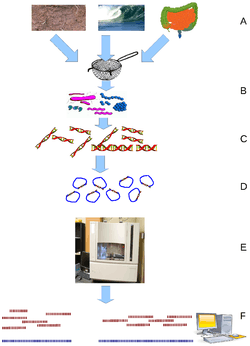 "Shotgun DNA sequencing using cloned DNase I-generated fragments". Nucleic Acids Research. 9 (13): 3015–27. doi:10.1093/nar/9.13.3015. PMC 327328 . PMID 6269069. 1 2 Pop M (Jul 2009). "Genome assembly reborn: recent computational challenges". Briefings in Bioinformatics. 10 (4): 354–66. doi:10.1093/bib/bbp026. PMC 2691937 . PMID 19482960. ↑ Mavromatis K, Land ML, Brettin TS, Quest DJ, Copeland A, Clum A, et al. (2012). Liu Z, ed. "The fast changing landscape of sequencing technologies and their impact on microbial genome assemblies and annotation". PLoS ONE. 7 (12): e48837. Bibcode:2012PLoSO...748837M. doi:10.1371/journal.pone.0048837. PMC 3520994 . PMID 23251337. ↑ Illumina, Inc. (2012-02-28). An Introduction to Next-Generation Sequencing Technology (PDF). San Diego, California, USA: Illumina, Inc. p. 12. Retrieved 2012-12-28. ↑ Church GM (Jan 2006). "Genomes for all". Scientific American. 294 (1): 46–54. doi:10.1038/scientificamerican0106-46. PMID 16468433. ↑ ten Bosch JR, Grody WW (Nov 2008). "Keeping up with the next generation: massively parallel sequencing in clinical diagnostics". The Journal of Molecular Diagnostics. 10 (6): 484–92. doi:10.2353/jmoldx.2008.080027. PMC 2570630 . PMID 18832462. ↑ Tucker T, Marra M, Friedman JM (Aug 2009). "Massively parallel sequencing: the next big thing in genetic medicine". American Journal of Human Genetics. 85 (2): 142–54. doi:10.1016/j.ajhg.2009.06.022. PMC 2725244 . PMID 19679224. ↑ Kawashima EH, Farinelli L, Mayer P (2005-05-12). "Method of nucleic acid amplification". Retrieved 2012-12-22. ↑ Chain PS, Grafham DV, Fulton RS, Fitzgerald MG, Hostetler J, Muzny D, et al. (Oct 2009). "Genomics. Genome project standards in a new era of sequencing". Science. 326 (5950): 236–7. Bibcode:2009Sci...326..236C. doi:10.1126/science.1180614. PMC 3854948 . PMID 19815760. ↑ Stein L (Jul 2001). "Genome annotation: from sequence to biology". Nature Reviews Genetics. 2 (7): 493–503. doi:10.1038/35080529. PMID 11433356. ↑ Brent MR (Jan 2008). "Steady progress and recent breakthroughs in the accuracy of automated genome annotation" (PDF). Nature Reviews Genetics. 9 (1): 62–73. doi:10.1038/nrg2220. PMID 18087260. ↑ Flicek P, Ahmed I, Amode MR, Barrell D, Beal K, Brent S, et al. (Jan 2013). "Ensembl 2013". Nucleic Acids Research. 41 (Database issue): D48–55. doi:10.1093/nar/gks1236. PMC 3531136 . PMID 23203987. ↑ Marsden RL, Lewis TA, Orengo CA (2007). "Towards a comprehensive structural coverage of completed genomes: a structural genomics viewpoint". BMC Bioinformatics. 8: 86. doi:10.1186/1471-2105-8-86. PMC 1829165 . PMID 17349043. ↑ Brenner SE, Levitt M (Jan 2000). "Expectations from structural genomics". Protein Science. 9 (1): 197–200. doi:10.1110/ps.9.1.197. PMC 2144435 . PMID 10739263. ↑ Brenner SE (Oct 2001). "A tour of structural genomics" (PDF). Nature Reviews Genetics. 2 (10): 801–9. doi:10.1038/35093574. PMID 11584296. 1 2 Francis RC (2011). Epigenetics : the ultimate mystery of inheritance. New York: W.W. Norton. ISBN 9780393070057. ↑ Laird PW (Mar 2010). "Principles and challenges of genomewide DNA methylation analysis". Nature Reviews Genetics. 11 (3): 191–203. doi:10.1038/nrg2732. PMID 20125086. ↑ Hugenholtz P, Goebel BM, Pace NR (Sep 1998). "Impact of culture-independent studies on the emerging phylogenetic view of bacterial diversity". Journal of Bacteriology. 180 (18): 4765–74. PMC 107498 . PMID 9733676. ↑ Eisen JA (Mar 2007). "Environmental shotgun sequencing: its potential and challenges for studying the hidden world of microbes". PLoS Biology. 5 (3): e82. doi:10.1371/journal.pbio.0050082. PMC 1821061 . PMID 17355177. ↑ Canchaya C, Proux C, Fournous G, Bruttin A, Brüssow H (Jun 2003). "Prophage genomics". Microbiology and Molecular Biology Reviews. 67 (2): 238–76, table of contents. doi:10.1128/MMBR.67.2.238-276.2003. PMC 156470 . PMID 12794192. ↑ Fouts DE (November 2006). "Phage_Finder: automated identification and classification of prophage regions in complete bacterial genome sequences". Nucleic Acids Research. 34 (20): 5839–51. doi:10.1093/nar/gkl732. PMC 1635311 . PMID 17062630. ↑ Hudson KL (Sep 2011). "Genomics, health care, and society". The New England Journal of Medicine. 365 (11): 1033–41. doi:10.1056/NEJMra1010517. PMID 21916641. ↑ O'Donnell CJ, Nabel EG (Dec 2011). "Genomics of cardiovascular disease". The New England Journal of Medicine. 365 (22): 2098–109. doi:10.1056/NEJMra1105239. PMID 22129254. ↑ Lu YF, Goldstein DB, Angrist M, Cavalleri G (Sep 2014). "Personalized medicine and human genetic diversity". Cold Spring Harbor Perspectives in Medicine. 4 (9): a008581. doi:10.1101/cshperspect.a008581. PMID 25059740. ↑ Church GM, Regis E (2012). Regenesis : how synthetic biology will reinvent nature and ourselves. New York: Basic Books. ISBN 9780465021758. ↑ Frankham, Richard (1 September 2010). "Challenges and opportunities of genetic approaches to biological conservation". Biological Conservation. 143 (9): 1922–1923. doi:10.1016/j.biocon.2010.05.011. Retrieved 30 May 2016. ↑ Allendorf, Fred W.; Hohenlohe, Paul A.; Luikart, Gordon (October 2010). "Genomics and the future of conservation genetics". Nature Reviews Genetics. 11 (10): 697–709. doi:10.1038/nrg2844. Retrieved 30 May 2016.